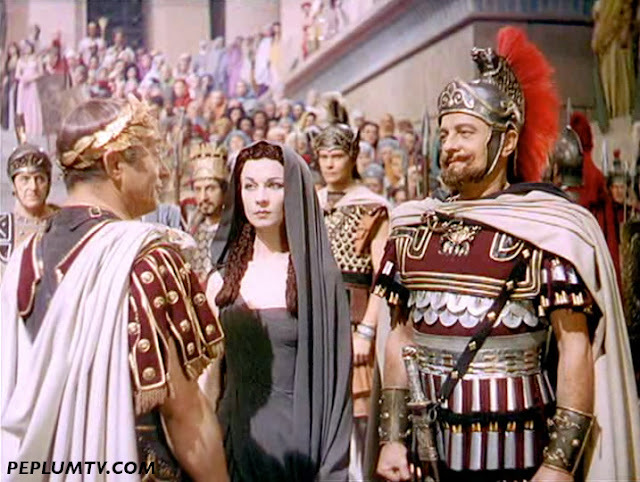 In the storyline, Perseus doesn't know his past and only the three dots connect him to the Queen mother. I like this angle to the story. Perseus was the son of Zeus but this is never mentioned in this film. One of the stand-out of the PEPLUM genre and, imo, it's Richard Harrison's best. As I noted yesterday, I'm taking so time off. Make sure to keep an eye on PEPLUM TV for new uploads. Back soon! Here's an overview of the previous banners for the blog since I started it back in 2010. Which one is your favourite? This film is one of those PEPLUM 'Frankenfilms' : big chunks of it were taken from two movies and re-edited with new scenes. 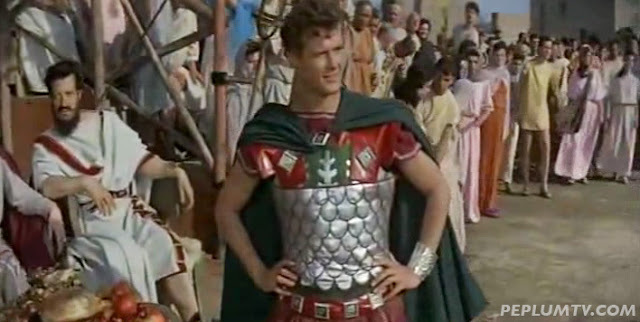 Fortunately, the scenes re-used from both films, THE BACCHANTES and THE TROJAN HORSE, both released in 1961, were also directed by the director of HERCULES AGAINST MOLOCH, Giorgio Ferroni. Ferroni is one of the best directors of the genre and I love all his films, including this Frankenfilm. Aside from Gordon Scott, who's in top form here, this movie is one of those rare films which hits all the right PEPLUM notes. It's a virtual PEPLUM buffet. I finally got a nice widescreen copy (thanks Alan) and this screenshot is from this copy (I already had one in English and widescreen but it was from a fuzzy VHS source). Will I make a FanDub with this? We'll see. As noted in the post below, Roger Moore is supposed to be in this film. There are some scenes with Roman soldiers and I scanned them. Is that Roger behind Vivien? It's like trying to find a needle in a haystack. Roger might have worked on the film as an extra but it doesn't mean he appears on screen. As I've said many times before here at the blog, I like this film. In fact, this was the film that made me love the genre before learning all about Italian PEPLUM films. I know it's not perfect by any means but I still enjoy it, mainly for its opulent production values. Roger Moore died on Monday, May 23. He was 89. Though he'll be remembered for playing James Bond in 7 films and also having the lead role in the THE SAINT TV series, Roger wasn't a stranger to the PEPLUM genre. In fact, his very first role was appearing as an extra playing a Roman soldier in CAESAR & CLEOPATRA (1945). It's amazing that he was still Bond in the 1980s 40 years after his first film. A fresh-faced Roger is entangled in a love affair with Lana Turner. Good film! Roger was Romulus in this comedy set during the first days of Rome. Scilla Gabel was one of his love interests (above). Roger looked the part but the PEPLUM genre wasn't his calling.